As I’m now in my last ever summer between academic years, I thought it might be fun to do a little day in the life post to show you guys what I get up to on a typical day at home where I don't have too much going on. I personally love reading posts like this and I figured I could turn this into a little series for when I’m back at uni/working/relaxing at home etc. I think it’s really interesting to see what people get up to in a regular day, even though for me somedays it’s not very much, so I hope you enjoy this little insight into my life! I usually get up around 9am, which I know for some of you early birds out there is incredibly late, but I'm making the most of my summer lie-ins whilst I can! I’ll potter into the kitchen and make myself breakfast, typically toast and a bru, before heading into the bathroom to wash/brush my teeth and get dressed. If I’m just staying at home for the day I won’t bother with makeup and I’ll usually just scrape my hair back into a ponytail. Usually, I take my mornings pretty slow and if I don’t have anything planned for the day I’ll either spend it reading or knitting *I know I know… I’m an exciting 22 year old*, or scrolling through and commenting on blogs that I follow. I also usually get whatever household things I need to do that day *clean the pots, put a wash on etc. *, done and dusted in the morning! Quite often, I’ll have a friend pop round in the afternoon for bru’s, cake and a catch up. Recently my friend Emma turned up with chocolate eclairs and we spent the afternoon chatting away before she jets off to Budapest. If I don’t have a friend coming round that day, I’ll spend the afternoon either working on my blog or writing. Working on my blog will consist of anything from brainstorming ideas, writing blog posts, taking/editing pictures or having a play around with the layout. Writing however will consist of either smoke coming off the keyboard when I’m on a role or banging my head against my desk because the words will not come. It’s fun, you should try it. I’ll carry on working on my laptop until around 7pm, when I will eventually pull myself to away to sit down and have dinner with my mum. After tea I’ll either carry on working on my laptop if I’m on a role, or I’ll go back to reading or doing something relaxing for the evening. Around 9.30pm I’ll make myself a cup of green tea and get whatever dessert we’ve got in the fridge, usually a couple pieces of dark chocolate, and sit down to watch whatever me and my mum are currently binge watching *we’ve just finished re-watching Gavin & Stacey*, before heading to bed around 11.30. I personally love quiet days in like this, especially if I've been productive and got a lot done, or had a friend round for a catch up. It's also been glorious weather in Manchester recently so I've been soaking up the sun in my garden as much as I can. Whilst every day is different, this is usually what a typical homey day will consist of. I'm making the most of my free time before it's back to the grindstone in my third year at university and I'm loving every second. Such a lovely post, I could do with a day like this round about now. I don't blame you having a relaxing time before you start back at uni! I loved reading this post so much. Everything looks so adorable! Lovely photos! I really do like reading these type of posts as well. Quiet days are great to have, especially when your day is usually so hectic. Definitely take advantage of them while you can! Your day sounds amazing, I wish I could get up at 9 but nope. It's either 6am for work or midday when I'm recovering from work haha! quiet days in are where it's at! 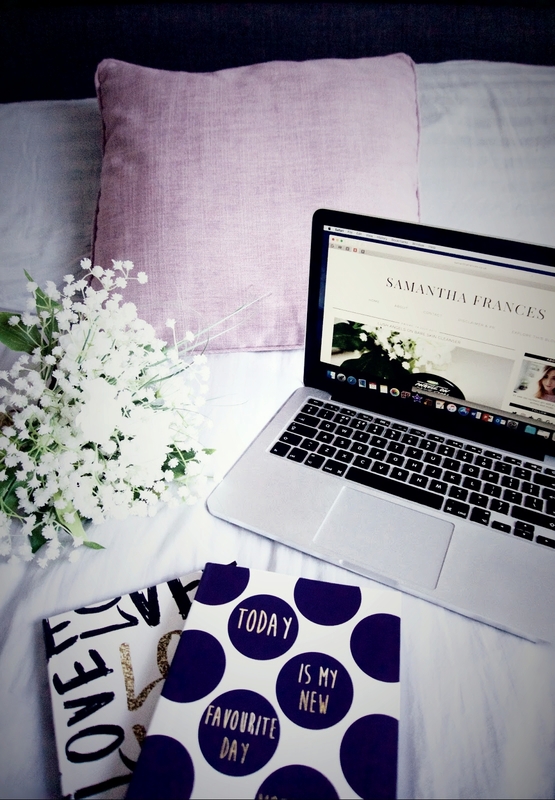 i love a chilled day at home, reading and catching up on blogs. and giiirl i WISH i could sleep in until 9am, my body wakes me up no later than 6.30am most days! oh to have a decent lie in! Your days seem really cozy! In enjoyed reading your post and I adore your notebooks, they look so cute!